Club Penguin Cheats by Mimo777 Club Penguin Cheats by Mimo777: Jet Pack Guy Doesn't Trust Herbert! 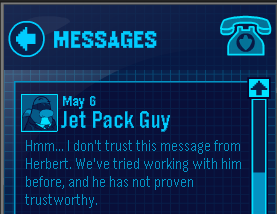 Hmmm, Jet Pack Guy doesn't think we should trust Herbert! What do you think? Has he not proven himself trustworthy? No WAY!! He blew up the PSA with popcorn, threatened to burn down the lodge, swore revenge everytime we stopped his plans!! I hope Gary doesn't believe Herbert, hes trying to trick us. We shouldn't trust him because in Elite Penguin Force, after he helped us save the island he totalie ditched us for protobot. We should not trust him as he keep planning to destroy us.He will not gain trust from us. Very effectively written information. It will be useful to anyone who usess it, together with myself. Sustain the great work – for positive i'll check out extra posts. Peachem. I don't think that Jet Pack Guy is a double agent. I think Rookie might be actually. Notice how his "accidents" always end up getting us into trouble and warning Herbert about our plans. I don't think we shouldn't trust Herbert either. I don't think we should trust him. I remember in the May sneak peaks, when they said that Herbert was going to attack in may. He looked like he was in the aqua grabber dome of the Protobot. Jet Pack Guy might of just pretended and he could be on Herbert's side and he could of told Herbert about System Defender, otherwise how did Herbert find out about it, Rookie might of been blurting it out though. Oh no!! I looked in my igloo, and MY PUFFLES ARE GONE!!! I checked my friends too, THEY'RE GONE!! I bet the Protobot did this! !